The transition to farming on the Polish Lowland, which is a part of the North European Plain, was a complex process lasting over a millennium. This is partly due to the diversity of the landscapes (Figure 1) from the Pomerania Lakeland to the north with its rolling glacial hills and the south with the flat monotonous Great Poland Lowland Plain. The largest area is covered by a light sandy soil, however, in some regions heavy, fertile mollic gleysols formed over a clay subsoil can be found; comparable to the fertile loess-based soils prevailing in the uplands of southern Poland. The LBK long house is a rectangular post-built dwelling with a pitched roof structure, which rests its weight on three rows of posts along the its axis (Figure 2). The side walls are created by a row of more densely spaced external posts sunk to a shallower depth than the weight bearing posts. In the eastern part of the LBK distribution area, including Kuyavia, there is as yet no record of foundation trenches in the buildings, which is a more common feature to the west. The length of these long houses varies from 12 to 40 plus metres, though the average is about 20 metres. The width is more standardised, ranging from between 5 to 8 metres. In the middle of the Bronze Age, around 1000 BC, the amount of metal objects increased dramatically in the Baltic Sea region. Around the same time, a new type of stone monument, arranged in the form of ships, started to appear along the coasts. New research from the University of Gothenburg, Sweden shows that the stone ships were built by maritime groups. The maritime groups were part of a network that extended across large parts of northern Europe. The network was maintained largely because of the strong dependence on bronze. Archaeologists have long assumed that bronze was imported to Scandinavia from the south, and recent analyses have been able to confirm this notion. The distribution of bronze objects has been discussed frequently, with most analyses focusing on the links in the networks. The people behind the networks, however, are only rarely addressed, not to mention their meeting places. Our early human ancestors may have left Africa more recently than thought, between 62,000 and 95,000 years ago, suggests a new analysis of genetic material from fossil skeletons. The new findings are in line with earlier estimates, but contradict a more recent study that put humans' first exodus from Africa least 200,000 years ago. The new results "agree with what we know from archaeology," said study co-author Alissa Mittnik, a biologist at University of Tübingen, in Germany. 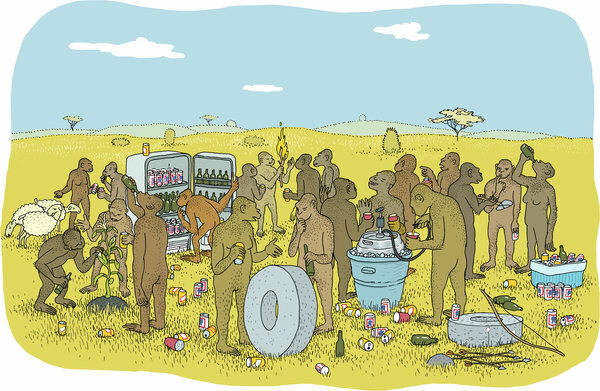 HUMAN beings are social animals. But just as important, we are socially constrained as well. We can probably thank the latter trait for keeping our fledgling species alive at the dawn of man. Five core social instincts, I haveargued, gave structure and strength to our primeval herds. They kept us safely codependent with our fellow clan members, assigned us a rank in the pecking order, made sure we all did our chores, discouraged us from offending others, and removed us from this social coil when we became a drag on shared resources. Thus could our ancient forebears cooperate, prosper, multiply — and pass along their DNA to later generations. But then, these same lifesaving social instincts didn’t readily lend themselves to exploration, artistic expression, romance, inventiveness and experimentation — the other human drives that make for a vibrant civilization. Researchers from the International Centre for Cultural and Heritage Studies (ICCHS) and School of Civil Engineering and Geosciences (CEG) studied the physical underpinnings and condition of Neolithic and Bronze Age rock art panels in Northumberland. They conclude climate change could cause the art to vanish because new evidence suggests stones may deteriorate more rapidly in the future. Writing in the Journal of Cultural and Heritage Studies, they say action is needed so the art can be preserved for future generations, but they also urge that a deeper understanding is needed of what causes rock art to deteriorate. Failure to Hunt Rabbits Part of Neanderthals' Demise? Neanderthals did not learn how to hunt small animals such as rabbits (pictured, a group of animals Portugal). Rabbits are small, fast, and devilishly hard to catch. And that could have had dire consequences for Neanderthals. A new study suggests that an inability to shift from hunting large mammals to wild rabbits and other small game may have contributed to the downfall of European Neanderthals during the Middle Paleolithic period, about 30,000 years ago. "There have been some studies that examined the importance of rabbit meat to hominins"—or early human ancestors—"but we give it a new twist," said study lead author John Fa, a biologist at the United Kingdom's Durrell Wildlife Conservation Trust and Imperial College London. Excavations at the Hinkley C site have revealed the remains of a 3,000-year-old Bronze Age settlement. Archaeologists have also discovered the first Saxon grub hut to be found in Somerset, and a number of Roman features and artefacts, including a grain drier, quern stones, a stone anchor, fishing net weights, jewellery and graves. The work was funded by EDF Energy as part of its site preparations and carried out by Somerset County Council. 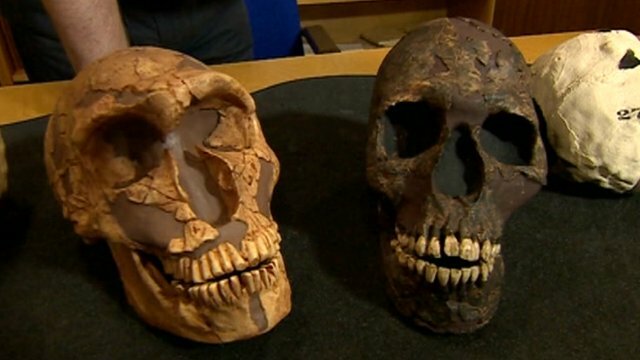 A study of Neanderthal skulls suggests that they became extinct because they had larger eyes than our species. As a result, more of their brains were devoted to seeing in the long, dark nights in Europe, at the expense of high-level processing. By contrast, the larger frontal brain regions of Homo sapiens led to the fashioning of warmer clothes and the development larger social networks. Scientists have unearthed six fishhooks, the oldest of which was made from a 19,000-year-old mammoth tusk. Hunters of ice age reindeer around 12,300 years ago likely left the fishhooks, along with mammal and fish bones, in an open field in what is now Wustermark, Germany. The fishhooks, which are the oldest found in Europe, suggests humans developed fishing tools earlier than previously thought, probably to catch fast-moving fish that appeared in lakes as the climate warmed. "These people had strong ideas to use the new resources of this changing environment," said Robert Sommer, a paleoecologist at the University of Kiel in Germany. The eel, perch and pike that entered lakes are too fast to snag with a harpoon or a spear, Sommer added. British researchers have proposed a new theory for the origins of Stonehenge: it may have started as a giant burial ground for elite families around 3000BC. New studies of cremated human remains excavated from the site suggest that about 500 years before the Stonehenge we know today was built, a larger stone circle was erected at the same site as a community graveyard, according to researchers. "These were men, women, children, so presumably family groups," University College London professor Mike Parker Pearson, who led the team, said at the weekend. "We'd thought that maybe it was a place where a dynasty of kings was buried, but this seemed to be much more of a community - a different kind of power structure." Parker Pearson said archaeologists studied the cremated bones of 63 individuals, and believed that they were buried around 3000BC. The location of many of the cremated bodies was originally marked by bluestones, he said. Centuries before the first massive sarsen stone was hauled into place at Stonehenge, the world’s most famous prehistoric monument may have begun life as a giant burial ground, according to a theory disclosed on Saturday. 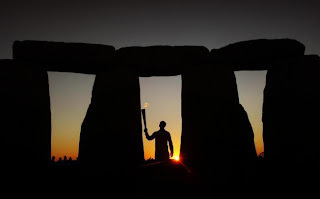 More than 50,000 cremated bone fragments, of 63 individuals buried at Stonehenge, have been excavated and studied for the first time by a team led by archaeologist Professor Mike Parker Pearson, who has been working at the site and on nearby monuments for decades. He now believes the earliest burials long predate the monument in its current form. A MILK tooth discovered in Granada has been declared the earliest known human remain ever found in Western Europe. The infants tooth was unearthed in the Cave of Orce and is believed to be 1.4 million years old. 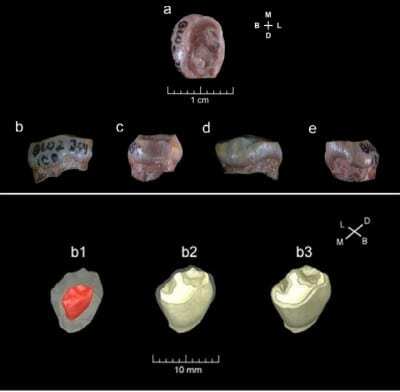 Archaeologists believe the tooth came from aHomo erectus or Homo habilis which correlates with another discovery in the cave. In 1983, Catalan archaeologist Josep Gibert visited the cave and found a skull fragment belonging to what he dubbed the Orce Man. THE 3,000-year-old Carpow log boat is about to embark on another journey – not by river, but by road. The waterlogged craft was discovered partially submerged in the mud, sand and gravel of Carpow Bank, at the head of the Tay Estuary, in 2001. Carved from a single tree trunk, it was an example of one of the first known boats in existence and was radiocarbon dated to 1130-970 BC. A Bronze Age raft has returned to a North Lincolnshire town after it was stored away for nearly 40 years. 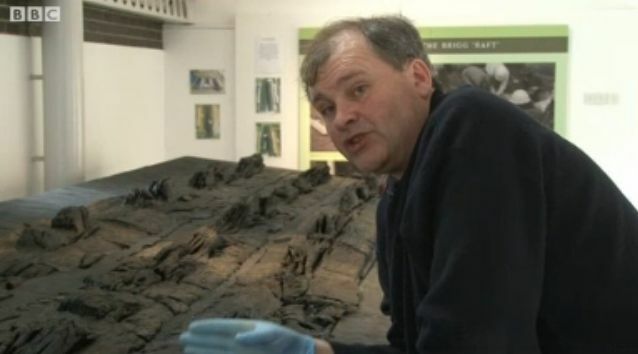 The 3,000-year-old flat-bottomed oak boat was found in Brigg but has been in storage at a museum in London. Now the ancient craft is being pieced together like a jigsaw puzzle and will go on display at Brigg Heritage Centre in May. Keeping up with fashions. A close examination of shell beads from Blombos Cave (top) suggests that ancient humans there started off with one style of jewelry (bottom) and then shifted to another (middle) over the course of 3000 years. The 2013 Academy Awards were, as always, as much about making appearances as about making films, as red carpet watchers noted fashion trends and faux pas. Both Jessica Chastain and Naomi Watts wore Armani, although fortunately not the same dress. And Best Supporting Actress Anne Hathaway switched from Valentino to a controversial pale pink Prada at the last minute because her original dress looked too much like someone else's. Of course, no actress would be caught dead wearing the same style 2 years in a row. A new study of ancient beaded jewelry from a South African cave finds that ancient humans were no different, avoiding outdated styles as early as 75,000 years ago. Personal ornaments, often in the form of beads worn as necklaces or bracelets, are considered by archaeologists as a key sign of sophisticated symbolic behavior, communicating either membership in a group or individual identity. Such ornaments are ubiquitous in so-called Upper Paleolithic sites in Europe beginning about 40,000 years ago, where they were made from many different materials—animal and human teeth, bone and ivory, stone, and mollusk shells—and often varied widely among regions and sites. A canine skull found in the Altai Mountains of Siberia is more closely related to modern domestic dogs than to wolves, a new DNA analysis reveals. The findings could indicate thatdogs were domesticatedaround 33,000 years ago. The point at which wolves went from wild to man's best friend is hotly contested, though dogs were well-established in human societies by about 10,000 years ago. Dogs and humans were buried together in Germany about 14,000 years ago, a strong hint of domestication, but genetic studies have pinpointed the origin of dog domestication in both China and the Middle East. For the first time in almost 3000 years – a full size Bronze Age style sea-going boat has been launched in Britain. Slipping gracefully down a slipway today into Falmouth Harbour, Cornwall, the 15m-long vessel was then paddled by its 18 person crew for two 500m trial trips. The launch – part of a long-term experimental archaeology investigation into Bronze Age marine technology – is already providing valuable new insights into prehistoric seafaring. “I’m so happy with the responsiveness of the boat. We always said you had to build the whole boat to understand what Bronze Age people experienced,” said the project’s leader, University of Exeter archaeologist, Professor Robert Van de Noort, who is working together with the National Maritime Museum Cornwall. 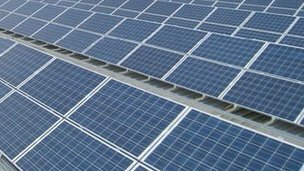 Archaeologists want a full study of the land before a proposal for a 50 acre (20 hectare) solar panel farm in Suffolk is considered. Hive Energy wants to put 40,000 solar panels on agricultural land at Hill Farm, Baylham, near Ipswich. Suffolk County Council's archaeological service said a systematic study of the land was needed first as the area has been inhabited since the Iron Age. Mid Suffolk District Council is due to look at the application this year. 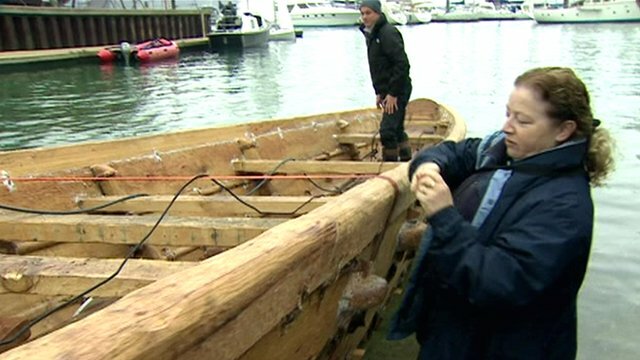 A replica Bronze Age boat which was built using traditional techniques gets ready to make its maiden voyage from Falmouth. 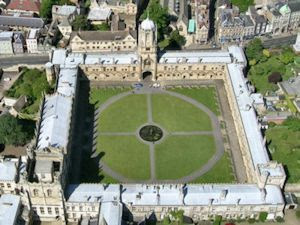 The construction is part of a collaborative effort between the National Maritime Museum and the University of Exeter. The BBC's Jon Kay takes a close-up look at how the boat has been built, even down to replica bronze tools used to carve the wood. Although the most drastic evolutionary changes occur over long spans of time, the effects of these changes can be seen relatively recently, argues Dr John Stewart, a Senior Lecturer in Palaeoenvironmental Reconstruction & Environmental Change at Bournemouth University. Dr Stewart has made important contributions to a growing body of work that shows how the evolution of ecosystems has to be taken into account when speculating between different geological eras. His work on the location of ice age refugia, the timings of species evolution and how palaeoecological data can be used as evidence of what may happen in the future has far reaching implications for own own species. Looking back to the time of the dinosaurs or even the single-celled organisms at the very origins of life, it becomes obvious that ecosystems existing more than 65 million years ago and around four billion years ago cannot be deduced from the one that surrounds us today. 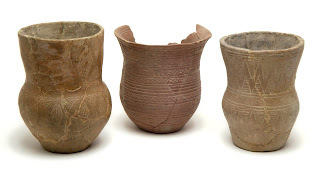 An Early Bronze Age hoard, which is thought to have been buried around 2000BC (4,000 years ago) has been declared treasure by H.M. Deputy Coroner for Pembrokeshire. The hoard of two early bronze flat axes, was discovered in the Community of Nevern, Pembrokeshire during early August 2011 by Mr Tom Baxter and Mr Luke Pearce. The axes were found less than 3 metres apart while the finders were metal detecting in a field under pasture. The discovery was first reported as possible treasure to Mark Lodwick, Portable Antiquities Scheme Co-ordinator for Wales (PAS Cymru) and was subsequently reported on by museum archaeologists at Amgueddfa Cymru – National Museum Wales. Did a Comet Really Chill and Kill Clovis Culture? A 130-foot-meteor created the mile-wide Meteor Crater in Arizona. The comet proposed to have impacted life in North America was significantly larger, but no crater indicating its collision has been found. The remains of two barnacle species that once lived exclusively on the exterior of whales have been found in a camp fire at the Cueva de Nerja (the Caves of Nerja) in Málaga, Spain. Researchers from the University of Valencia have dated the charcoal from the fire to between 14,500 and 13,500 years ago. Scientists at the University, coordinated by Professor Joan Emili Aura Tortosa, analysed stone artefacts, horn and bone found in the fire along with the charcoal to arrive at the date. The scientific results show evidence of human consumption of whale meat during Prehistory in Europe. The remains of the whale barnacles were found in occupation layers dating to the end of the last glacial maximum and associated with the Upper Palaeolithic Magdalenian period. When were Homer's works written? One of literature's oldest mysteries is a step closer to being solved after a recent study that dates the The Iliad to 762 BCE and adds a quantitative means of testing ideas about history by analyzing the evolution of language. 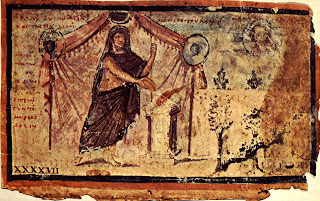 The epic poem The Iliad, set amid the final year of the Trojan War, is attributed to the ancient Greek poet Homer and is foundational to Western literature, but scholars have not reached a consensus about whether it was written shortly after the war or centuries later. Archaeological and historical evidence have placed the text's origins in the 7th or 8th century BCE, but such records are sparse and often have an uncertain validity.